While surfing around this evening, I found a story at USA Today about how mortgages are at a 37-year low. A 30-year fixed-rate mortgage averages about 5.28% right now. I don't usually pay much attention to these stories. We refinanced our first house (from a 9% 30-year loan to a 5.75% 15-year loan), but our current mortgage is in a kind of phantom zone: We have a $207,000 balance at 6.25%, with about 25 years remaining. We think our home is worth about $350,000 ($333,500 according to Zillow), even after the wild swings in housing prices over the past few years. The best option would give us a 5.00% rate and a monthly payment of $1111. (Our current monthly payment — principal and interest only — is $1386.60.) We could conceivably save $275 per month by re-financing. A payment of $1018 per month? That's $378 less than we're paying now! Yes, I do see the $6634 in fees and points. Yes, I understand that it will take us 18 months to recover these costs. That's fine. We still plan to live in this house forever (or until we can afford to relocate to Wells, England). As a reminder, Kris and I have a mortgage prepayment plan in place. For the past year, we've paid $2000 every month, knocking off a a few hundred dollars in principal each time. We would continue to pay $2000 every month even with a new loan, so we're looking for a low interest rate and low fees. I'm going to call AmeriSave to find out more about their rates. I'm going to call my current mortgage company to see what sort of rate they can offer. I'll go through the process at MoneyRates. I'm refinancing my mortgage from 6.375% to something lower. I originally locked in my rate at 5.25% just in case it went higher. But the rate dropped to 5.0%. I realized my $300 application fee was less than what I'd save in just 9 months of interest at the lower rate, so I called up and they agreed to keep my application open, charge an extra application fee (instead of starting over with all the paperwork) and lower my rate. But now the rate has dropped to 4.875% and could go even lower! I guess I'll just keep paying the $300 until the rate still drops. But it feels wasteful. As a reminder, our current mortgage balance is $207,000 at 6.25% with 25 years remaining on the loan. Our monthly payment (including taxes and insurance) is $1671, but we pay $2000 every month in an effort to eliminate the debt sooner. A 30-year fixed rate at 4.96% with no points and closing costs of $2556. Our monthly payment (including taxes and insurance) would be $1409. A 15-year fixed rate of 4.625% with no points and closing costs of $2556. Our monthly payment (including taxes and insurance) would be $1909. I completed the refinance application over the phone. The next morning, UPS delivered the documents for us to sign. It wasn't until last weekend that I had time to read the paperwork, though. I called back with several questions, gathered the required documentation, and yesterday I sent the forms back to Maryland. Assuming no hitches, we should have a shiny new lower mortgage rate in about a month! To this point, refinancing has been simple. The most difficult part of the process is choosing which term we want: 15 years or 30 years. It's true that we've been paying $2000 per month toward the mortgage, so we know that we could manage the $1909 payments for the shorter term. On the other hand, dropping our required payment to $1409 gives us a great deal of flexibility should something go wrong. Ultimately, we chose the 30-year mortgage. It's worth it to have the increased flexibility. Since we hope to continue accelerating this loan, our final payment is projected to be around 2023, only fourteen years away. We made extra sure that this new loan agreement had no penalty for early payoff. Note: There's talk in Congress of driving mortgage rates down to 4%. If you think this is likely to happen, then it makes sense to wait before refinancing. Kris and I decided we'd rather take advantage of a good rate now than wait for a great rate in the murky future. Do what works for you. That's what makes an economist happy, apparently. Me? I'm just glad to trim $262 off of our required monthly payments so that even more of our extra money goes directly to paying down the principal each month! We did it! After two months of hemming and hawing, Kris and I finally closed on our mortgage refinance, dropping our rate from 6.25% to 4.96%. Bright and early yesterday morning, we made a trip to the title company, and we signed all of the documents. We were out of there in only half an hour. How'd we do it so fast? Don't I advocate reading all contracts before you sign them? Absolutely. So when then the title officer called on Friday, I let her know in advance that I needed to read everything first. And that's just what I did. It took several hours, but I leafed through all 107 pages, looking for anything alarming. I can't claim to have understood all of the arcane legalese, but I gave it my best shot (with Google's help), and I didn't find anything that raised a red flag. Remember: Saving money on the little things every day is great, but saving money on the big things can make an awesome difference to your budget. You'd have to wash a lot of baggies to save $250 a month! There are 164 reader responses to "Refinancing Made Easy: Our Story". We refinanced after your article about it right before Christmas. We got 4.825% on a 15 year with right around $1600 in closing cost (no points or origination fees). We only had 8 years left on our existing 15 year loan but we refinanced to another 15 year mortgage. It lowered our payment by almost $400. Our plan is to pay at the same rate we have been paying and still pay it off in about 8 years. But, this gives us the flexibility of a lower payment should a job loss or other financial crisis occur. And, like you, the whole process was quite easy. I even ran that mortgage by my fellow economists. They’re also refinancing I think. I called my mortgage company right after I saw your article in Dec. of 2008. My wife and I bought our first home in earlier that year so I wasn’t sure how we would make out refinancing that early. We got a new rate of 5%, down from 6%, and we would be saving a little over $150 on our monthly payment. Since it was an FHA loan he was able to “streamline” the mortgage which saved us a considerable amount on the closing costs. It ended up costing us about half of what we were paying for a monthly mortgage payment. Refinancing was dead simple through my credit union, and my previous mortgage lender called me *yesterday* a week after I finished refinancing to reply to the emails I sent *weeks ago* through their web site asking for my options. He didn’t seem to be aware that I’d already left his institution. We are also in the middle of a REFI, we went with a 25 year loan (we are 4 years into a 30 year term at present). We could have gone with a 20, 25 or 30 year at our locked in rate 4.78 (no points). We decided to go with 25 year term because while we would like to pay off the mortgage earlier, and we plan to, we want to have some flexibility if and when we have kiddos. But we didn’t go with 30 years because we didn’t want to add more time onto our current loan. I watched the rates from November into January and locked in mid-Jan. I missed the bottom by one day with my bank. Are rates going to go lower, some say yes and some say no, so we went with a known rate. Since then the rates have come back up with my bank. If we get past the appraisal, we’ll save about $200 a month on our mortgage and $80,000 in interest over the course of the loan. We plan to keep paying our current mortgage payment so we’ll be prepaying $200 a month. Thanks for using numbers and showing us exactly what your situation is in regards to what most people consider a very personal topic. A real-world example is really invaluable. Also, I agree with your decision. The flexibility of the 30-year is a huge factor in case of any emergencies. We looked into refinancing right after your last article on the topic. I called my current lender and couldn’t get through. I used their online form, which indicated I’d receive a call back within 15 minutes; it took them two days to get to me. They, too, said they were swamped. While the rates they provided were good, the closing costs were extremely high. Also, the woman I was working with kept sending these horribly written emails with loads of typos and nearly incoherent sentences. There were emoticons scattered throughout each of the emails. As a result of the high closing costs and the chatroom style of the person we were working with, we decided to abandon it. I couldn’t help but wonder in what other areas this company is unprofessional if they allow their employees to be so lax with basic communication. We may hold out now to see what Congress does. Our current rate is 5.5%, so we’re not in bad shape for now. I tried the Lending Tree route as well and was mildly disappointed in the rates I was quoted. Anywhere from 4.5% to 5.5% but all had points and/or fees that made me say “wait a minute.” Not only that but I get 12 phone calls and 5 emails each week. Looking at these rates against the backdrop of a local bank with 4.25% rates (no points) and our nanny state Federal government attempting to offer 4% fixed 30 year loans and I’m glad I waited. While it’s true that a 15-year loan always pays off in 15 years, I agree with J.D. that opting for the 30-year mortgage provides a little more flexibility month to month. In a pinch I would rather owe $1400 per month than $2500 per month. In good months it might make sense to throw $2500 at the mortgage, but it is nice to have that as an option, rather than a requirement. Suze Orman gives the following advice re refinancing — if you’ve paid off say 5 years on your current mortgage, then you should refinance into a new 25 year loan. Please don’t make the mistake of refinancing into a 30 yr. loan, for that extends your total mortgage term to 35 years. This really makes sense to those who do not intend to do any prepaying once they refinance. Does anyone know if you can refinance student loans? I think JD made the right choice as well on the 30-year. Since you would be on schedule to pay it off in 14 years on a 30, it made perfect sense to go ahead and give yourself that cushion should you need it. I think you should write some articles for those that want to take advantage of these rates and have great credit, but are having trouble getting financing because we don’t have enough equity in our home because our value has dropped so much. It’s a bit frustrating because every loan officer says we are perfect to work with its just we don’t live in the best of places and our value has dropped considerably in the past 5 years. Yuck! @ Kim – sure you can…if you can find someone willing to do so. When you consolidate you are essentially refinancing several small loans into one big one. The big one pays off all the small ones and you have a new rate based on market conditions and your specific risk profile. It’ll be harder to find someone to refinance these than a mortgage, but it’s definitely possible. If you have a home, you could even refinance extra out of it and use the money to pay off your student loans if they’re at a higher rate than current rates. We are thinking of refinancing a rental property we own but want to wait to see what happens with the stimulus package…it’s looking more and more like there is going to be something in there concerning rates. Our home-home is paid off. I’m actually holding off. Some Senators are trying to add a 4% interest rate into the stimulus bill for those who want to refinance or buy. I’m going to wait to see whether it flies. Because then that could be a really sweet deal. Since you didn’t go with the 15 year (that would be my advice), do this. Pay the 15 year mortgage’s payment. Just set that amount up for your automatic payment on the 1st of every month and let ‘r rip. We decided to refinance after my credit union sent us an email a few weeks ago promoting 4.99%, 15 years with NO points, NO prepayment penalties and NO costs. I immediately applied online and was approved that same day. We only have 10.5 years left on our existing mortgage that has a rate of 5.74%. But when I apply our current payment to the new mortgage we will pay off our new mortgage in less than 8 years and save over $9000. We are going for it! I have been meaning to call about my refi with my credit union ever since I read your first post. Anyways, would love to hear from folks who have successfully done this. I am waiting to hear back from my mortgage counselor at my credit union. Thanks for all the great posts on here everyone…! I have a question with regards to refinancing, not sure anyone will know the answer. We have an 80/20 loan. The 80 is fixed at 6 and the 20 is variable. Is there a way to refinance in to ONE fixed rate mortgage now that we are in a better position financially, or does that even make sense to do. Also, if you are not sure you are in your “forever” house and you may sell in 3 – 5 years, does it make sense to refi still? And Nicole: if you originally financed with an owner occupied you probably already have the best rate you will get. Rental properties are going to finance for 1-2% higher than owner occupied. They are significantly more risky and the prices reflect that. And if you don’t have at least 20% equity in it most banks won’t even talk to you. 10% was the minimum four years ago when the market was hot, and they have really backed off over the past couple years after getting burned. Other than that, I’m not reading comments today because reading the deals everyone got that are better than mine will make me cry. But I wanted to say that I find it interesting how much we are willing to pay on a mortgage for good customer service. I was looking at Amerisave and my local broker. The local broker was a little more expensive when I was looking so I decided to go with Amerisave, but that broker wouldn’t call me back and just blew off my concerns about locking when things were looking really good. He wound up losing me as a customer and I went back to my broker I had faith in who has always been spot on. I’m trying to convince my friends to refinance. They got an 80-20 piggy back loan that they really can’t afford, and the piggy back has an adjustable rate that is going to reset to 25 percent!!!! It’s also Interest Only. I know, awful. But they are resisting because they can’t afford to pay any more than they already are. They are going to have to because they are going to pay more either way, and if they don’t refinance, they will likely lose their house. Ugh. As for us, we did a 15 year fixed rate on our current house. We’ve lived here 3 years and we’ve paid it off already. We used the money from the sale of our last house to pay half of it, then sold some stocks right before the big market drop to pay some more, then just worked like hell to make extra payments. We lived through a lot of uncertainty with our mortgage and our house due to Hurricane Katrina, so owning our house outright because No.1 priority for us. JD You made a good choice, and the rates are unbeatable. If you can keep making extra payments, you’ll have that house paid off in no time. It would be a horrible decision to mandate 4% mortgage rates across the board. The 4% rate will likely only apply to a small subset with the most pristine credit. Further, it would be very difficult to find buyers who would want to invest in 4% loans. Further, the main thrust of the 4% mortgages would NOT APPLY TO REFINANCES. They’re almost strictly being spoken off as new home loans. This is an important point. Shara you are great. Thanks for the info! I have thought about refinancing but I have an 80/20 loan and everything I hear is that I will have to pickup PMI because noone is willing to mess with those second loans anymore. Also at what point is it worth while, I currently have a 5.65 on my primary mortgage, is less than 1% worth it? We went with what Suze Orman recommends, according to Sandy E, we are 4 years into a 30 year mortgage so we are refinancing into a 25 year mortgage so we don’t add any more time to our loan. We will continue to pay at our current rate so we will cut more time off our loan. We would also like to refi two of our investment properties but we are focusing our efforts on getting our primary home taken care of and then we will look at our investment properties. One was a primary home (Mr. Sam’s) when he bought it so its doubtful that we will get much of a better rate now if we refi as a secondary home and the other was an investment property that we’d like to look at refinancing but we doubt that we would get a good enough appraisal (we bought it in 2005) and right now we don’t have PMI as we put down 20% but the value has likely dipped. Where are you all finding such good rates? We live in metro Detroit so it must be our area, the rates are still to high. We have 2 mortgages (one was for a remodel a few years ago) and we’ve been paying both down early. One is 5 7/8% and one is 6 1/4% – we paid the first down early and when we added the 2nd with the higher rate we now pay that one down. Our credit scores are both in the 800’s and although home values have gone down we have enough equity in ours to not worry. Even through the credit union, the lowest rate without points is 5.5%, with .5 point is 5%. We had a similar experience as far as credit scores and bankers surprise that you did. Our banker said we had the highest score he’d seen all year and that the loan (we were moving so we were taking out a loan instead of refi) would be a breeze. Funny thing is my credit score was 5 points higher than my husband’s and I don’t even have an income! I went with a mortgage broker, who found a lower rate than I could have on my own. I agree with the person who warns you that you are extending the life of your loan, JD. You should see if you can get a 15-year loan through a mortgage broker at a low enough rate that you have the smaller-size payment AND a short loan term. I got 10 years at 4.5% — it was a smaller loan amount, but the monthly payment is $673. I’m overpaying each month and you can imagine how fast this mortgage is disappearing. Also, inflation is coming up on 4% per year — the $1909 won’t seem like a very big payment in a few years’ time. I don’t think much about how much I’m “saving” each month in payments — my concern is the interest rate. Given that I’d want to be out of debt as fast as possible, I don’t aim for lower monthly payments on anything. Rather, the thought of paying interest to the bank drives me crazy. For that reason, I would have chosen the lower 15 year interest rate. Given that you and Kris already pay more than $1900 per month and given that you are both responsible with your money and are unlikely to find yourselves in a dire financial situation, it seems like it might have been wise to choose the loan with the lower rate. I would love to refinance to take advantage of lower interest rates and lower my payments. At this point, any breathing room in my budget would be a blessing. However, since I purchased in mid-2006, my equity has gone down the toilet and I’d end up paying PMI—decreasing any savings I’d see in my monthly payment. Add this to the fact that I’m staying put—for the short term—but when the market improves, I want to sell my house and get into something cheaper. So refinancing now (unless it was completely free) wouldn’t make much sense. . . . I like the idea, though, of taking out a 30-year mortgage and then setting up your payments to match the 15-year mortgage payment. Although the interest rate on the 30-year is a bit higher, you’ll still end up saving literally thousands in interest payments. I should note that although Kris and I have opted for the 30-year loan, we have until a few days before closing to switch to a 15-year loan instead. We’re not locked into the longer term yet. J.D. you can always get a 20 yr. loan too — that’s what I did once when I refinanced my house some time ago. Run the numbers to see if you’d be more comfortable w/a 20 yr. than with the 15 yr., and you can always prepay too. JD: Have you heard of the Total Money Makeover by Dave Ramsey? I don’t have the book to reference right now, but I think he gives specifics as to why people shouldn’t refinance and/or taking the 15 year fixed mortgage over 30. Additionally, I wanted to know if you or anyone had an opinion on his book. Can you explain what you mean by “accelerating” the loan by $100 a year? (and what’s your starting point). I got our mortgage through a broker locally five years ago and I also got quotes from Lending Tree. When I quoted the lower closing costs from some of the LT people to the local broker, he matched them — no problem. Now I just went the LT route last week for a refi. My FICOs are all over 800, so I’m telling all of the lenders they have to be extra competitive to get me. We’ve also called our credit union and I intend to contact our local guy again. Congrats on your rate and 15 years — woohoo! PS — Is Winston willing/able to name the company he used? If you have great credit, can one refinance if you have less than 20% equity in the home? When researching, I get conflicting information. My two cents: I’d go with the 15-year loan. Getting the 30-year loan is a decision based in fear (“I might not have enough money to pay this in the future.”) The 15-year loan is a decision based in abundance (“We’re already paying that much every month and have a substantial cushion.”) You are responsible, have a safety net, and have no other debt. In addition, your blog income is going up over time. Make the abundant decision instead of the fearful one…and reap the rewards of paying your house off early. @Gary LaPointe wrote: Can you explain what you mean by “accelerating” the loan by $100 a year? (and what’s your starting point). About this time last year, I wrote about our mortgage prepayment plan. Our monthly mortgage payment (including taxes and insurance) is about $1670 per month. Our goal was to pay $2000 a month, effectively contributing another $330 to the principal. When Kris wrote the thing about “accelerating the loan by $100/year” that’s shorthand for a plan we keep talking about. We’re paying $2000 a month now. But what if we pay an additional $100 monthly every year? So, in other words, what if we paid $2100/month in 2010 and $2200/month in 2011 and $2300/month in 2012? We haven’t actually implemented this yet, but it’s something we’ve considered. Also J.D., as I mentioned we are going with a 25 year REFI and my bank offers 15, 20, 25 and 30 year fixed rate mortgage products. You might want to see if you can go with something in between 30 and 15. And for those who are interested in managing their own escrow payments (i.e. saving and earning interest on monies that are used to pay taxes and insurance) REFI is a great time to opt out of bank escrow payments. Interesting post about usda home loans in rural areas. Apparently, the qualifying is pretty straight forward, with better interest rates. We’re British immigrants and moved to the US 4yrs ago. Although we were debt-free when we arrived (and put down 20%), with no credit rating here we couldn’t get a fixed rate loan (very unfair! )All we were offered was a 5/1 ARM at 5.25%. This is due to adjust in Jan 2010 and could go as high as 8.5%. So far we’ve been offered 5.25% at our local credit union, but the closing costs, prepaids and reserves are horrifying (they want $8000). We have nearly 40% equity so no PMI, but I hate to lose those 4yrs that we’ve already paid when the ARM was not our choice in the first place. Our present bank will continue our amoratization schedule if we continue with them though. We plan to call this week and see what they’ll offer. In November it was 6.25% so I don’t hold out much hope for anything under 5%. This is a totally new game for us and we already feel scammed by the system. Any advice would be gratefully received. Thanks to you too J.D. for your posts on this subject. They’ve really helped us to understand the mortgage system here. Refinancing rental properties is going to be tough right now. Most rates for rentals are 1-2% higher than owner occupied housing and banks are requiring 20% down. I checked into refinancing my rentals when the 30 yr rate was around 5%. The best I could do was 6.75% and I have 20% equity. As a person who’s never had a mortgage, can someone explain to me what the heck a “point” is, why it matters, and how to translate it into a unit I might care about, like dollars? I’ll gladly trade you some “points” for better interest rates. We can go play some one-on-one basketball, and we’ll start the score at two-nothing, your favor. Now can I have my 4% mortgage rate? I tried calling my lender to refinance, but I bought in 2005 and the LA market has been hit hard. Based on their required 20% equity and their online home price evaluator, I’d have to come to closing with $153,000! I owe $325,000 so I would have to pay off half of my mortgage to refi. There are a lot of people like me who bought in the last 7 years and can’t refinance because we’re upside down. You’re now self-employed, right? Did you find it any harder to obtain refinancing as a result? A “point” in mortgage parlance is 1% of the loan. So, in Winston’s case, one-third of a point is one-third of 1% of his loan amount. Points are paid to buy down the interest rate. In 1998, for example, when Kris and refinanced our house, we paid some amount (one point? half a point?) to buy the interest rate down from 6-1/8% to 5-7/8%. This can be a fantastic deal if you plan to be in your home for a while. It can be lousy deal if you sell before recovering the costs of the points. It’s difficult to compare mortgages without knowing if points were paid. A mortgage at 5% and no points is much better than another at 5% and one point. Ultimately, however, the important thing is to look at the total cost of the loan (including points, interest, and closing costs) in relation to how long you expect to be in the house. Instead of paying the 15 year amount into the 30 year mortgage, why not pay the minimum to the 30, and pay the extra $600 into an external investment? When the external investment equals what you still owe on the mortgage, pay the house off outright. This works on the theory that the stock market (or wherever you invest the difference) will do better than 5% over the next 15 years or however long it would take you to pay it off. Mike wrote: You’re now self-employed, right? Did you find it any harder to obtain refinancing as a result? Very astute question. Very astute. So it’s sort of like a “down payment” on the loan, except that it doesn’t actually go toward paying the loan off? A $100,000 loan with a 5% rate and 1 point would have a $1000 fee paid at closing, with the loan still having a balance of $100,000, correct? Just want to make sure I understand that correctly. Yes, that’s my understanding. It’s more like a downpayment on the interest, not the principal. You’re paying the bank a lump sum instead of spreading it out over 15 or 30 years. JD, congrats on the smooth refinance so far. What really caught my attention about your post though was that all the paperwork was done by mail. I am frankly suprised banks are still doing this since the lending process has gotten rather onerous again. I have heard of at least one case of fraud when papers were signed outside the presence of closing agents (someone signing for someone else). (I know signing with a notary public is supposed to keep this from happening, but unfortunately many times notaries do not do their job as they should and actually ask for ID and make you sign in front of them). Congrats, J.D.! We’re playing the waiting game right now. Our current rate is 5.75 for 15 years. We’ve seen lower, but we’d really like to go with the same mortgage company as before with no closing costs, the best rates, and fantastic customer service, but they will only allow you to refinance once a year so we have to wait until the end of June. I’ve called our current mortgage company, Wells Fargo, and was told someone would get back to me, but that hasn’t happened yet. From what I can understand a point is just another term for “fee”, it’s another way of saying how much they are charging you for decreasing your mortgage rate, from what I can tell. So if you had a mortgage to 100K, charging you 1 “point” (1%)no closing costs your mortgage would be reset to 101K but at that lower rate. I’m really hopeful that the continued softening of the real estate market, combined with lowered interest rates, will actually allow me to purchase something as a single person in the bay area. We’ll see – I’m reasonably picky about where I live, won’t stretch myself unduly with my financial commitment, and am not willing to have a major commute. So, I may not find the right situation. As sad as I am about the state of my retirement accounts, I also feel like we’ve gone back in time in the real estate market. I estimate I have the rest of this year before things start to improve – we’ll see if I’m right! I definitely agree w/Sam #40 above to opt out of bank escrow accounts when you refinance. Make your home ins. payment and property tax payments yourself. Why deal w/a middle man? Also, you can then pay both of your property tax installments before the end of each yr. to help you at tax time should you choose to do so. I did that this year. Re: 80/20 loans… it may be worth talking with a mortgage broker. If you’ve been in your house for a few years, and you’re not in a market that has totally tanked, and you have good-to-excellent credit, you may still be able to refi, rolling the majority of your second/HELOC into a new first, and then take out a much much smaller second to cover the remaining amount above 80% LTV. I’ve been talking to our credit union and a mortgage broker about this very thing, and I gather that if you’re close to the 80% LTV, some lenders are still willing to do a second up to about 83% or 85% LTV… It may be preferable to go this route than it would to pay mortgage insurance, since I gather you have to keep mortgage insurance for a minimum of two years, and then your LTV has to be down to 78%–and you’re still on the hook for paying for a new appraisal. The escrow accounts pay diddly squat for interest. So you’re right, keep the property tax money in a High Interest account, and pay that yourself. @Jericho – the article you link to re: refinancing being shut out of the low mortgage rates is from December – I read an article this morning (probably CNN) that specifically said that the new plan is to include refis on the low rates, or at least low rates. I’m talking with a mortgage broker right now who is quoting in the 5.25% range, watching the MBS every day. ‘Course, she also is quoting ~5k for origination and closing…. We are in the middle of a refi. Our house appraised for 7% less then our purchase price last June. The mortage Co. had a appraisal review and kicked it down another 8% (not sure why they used an appriaser then). So we are closing the gap with $aving$, to get 5% conforming loan and saving $771/mo. It’s a bit of a sacrifice, but will pay off in the long run, and allow us to rebuild our e-fund quickly. I am glad it worked out for you. I am having a heck of a time trying to refinance. Our current rate is at 6.25%, so we want to drop to around 5 if we can. Lending tree never contacted me after I submitted all my info! I can’t believe they emailed you every day, no one would offer us a mortgage. I called a local bank, they refused to waive escrow (I think this is a sticking point for many companies). We called our current mortgage company, they are too busy to handle our refi, so referred us to Amerisave, with a reduction in fees. Ha! Every quote we get from Amerisave is almost $5000 in closing costs. We have excellent credit. I keep reading about people that only pay $2k in fees or so, and I don’t want to pay $5k in fees and closing costs, that doesn’t make sense. I am very frustrated with the whole process and have just about decided that it isn’t meant for us to refi right now. I am very very interested in this idea. I think this would be a great idea for a post. Is there some kind of formula you can plug in, say 5% of your monthly payment that you can squirrel away every month for this payment? I know tax rates vary, but it would be interesting to know if there is some kind of middle of the road amount you can at least start with for planning. I guess I could also just look and see how much I pay every month for escrow/ins and how much rolled over to my new year’s amount. Is this just one more thing to take over?? Or are there added benefits besides having the extra money in a high interest account instead of having, say, Countrywide do it for you?? First, we have interns at our place and we don’t pay them enough to have the wife, much less a mortgage to refinance. My situation may be dissimilar to most people considering refinancing: At the time I inquired into a refi, I owed only about $20,000 on the loan. And I found no one would refinance for less than $50,000, including my current mortgage company, which KNEW the balance when they solicited me for a refinance. I gave up on the refinancing because I didn’t see any reason to overborrow and just decided to overpay the principal every month and have the balance down to about $5,800 now, with the house to be paid off in October without a refi. Just in case some of your readers have their mortgage down to under $50,000, it’s just a little piece of info to have. It is important to quantify your potential savings before discussing removing an escrow account. It really depends on how much escrow you pay. For me, let’s say my property taxes are $1,500/yr and my insurance is $1,000/yr. So, we are looking at $2,500/yr potentially invested at 2.5% in a high yield savings account? That would be $62.50 a year (actually less than that, because the escrow is built up over time – somebody help me with the math here). Yes, I would rather have the money in my pocket than in the bank’s. But in exchange, the bank will make sure the bill is paid and keep you from defaulting because of lapsed insurance or unpaid taxes. Plus the bank gets a warm fuzzy feeling because they know the asset is insured. If you pay a lot of property tax, or your insurance is very high, it might be worth it, but it is not a huge return otherwise. @ #63 — With regard to paying your property taxes yourself, you will need to divide the annual amount by 12 months, then set aside that amount monthly in a sub-savings account. Property taxes are due 2x per year. As far as home insurance payments, that’s a monthly bill. Just a word of caution re HELOC’S – you are using your home as collateral, and so you could lose your home in the event of a financial or medical hardship if you were not able to make those payments. It’s shifting debt. The only way to start laying a foundation for long-term financial security is to get out of debt, not shift it around. Well, I’m jealous reading about these low rates. My credit score is so low just about the only loan I can get is a hard money loan. I am borrowing about $85K to purchase my next house. The interest rate is 12.5% which means my payment is around $900 a month interest only. There is a balloon payment. There is a prepayment penalty. The closing costs are $15K. It’s a horrible loan but the best I can get. The lesson? Safeguard your credit score. A good score will save you thousands of dollars over your lifetime. This is a concept I never thought about or wanted to think about until fairly recently and my failure to adhere to even a semblance of this concept has indeed cost me thousands. Hi JD. Very timely post. As others here have suggested, it’s worth considering the 15-year mortgage. Although the 30-year option does give you greater flexibility, as you mentioned, you are paying a steep price for it if you don’t accelerate your payments, and the interest rate is nearly a third of a point higher. If Kris can carry the mortgage with her income (albeit just barely! ), then the biggest risk looks to be the sustainability of earnings from GRS. Since you’re able to afford payments of $2,000/month now, and it’s not a stretch for your budget, why not go with the 15-year option at a lower interest rate. At a minimum, don’t “restart the clock” by going back out to 30 years. You’re just going back to paying down almost no principal every month unless you go with accelerated payments. If 20 or 25 years is an option, why not go with that AND accelerated payments. You won’t pay it off quite as quickly as the 15-year option, but you’ll benefit by having the flexibility of lower monthly payments, which you can top up as your income allows. I recently canceled a potential refinance through Amerisave, and I’m surprised that more people haven’t mentioned this. They charge a vague fee called their “Sure Fee”, and in my case, it was 5-6 grand. I have excellent credit, btw. Here’s the kicker: the broker said she DIDN’T KNOW what the specifics of the Sure Fee were. I asked about points and she said she wasn’t sure because that Sure Fee is a general fee by the lender and doesn’t have specific info. I couldn’t believe their customers don’t get a break down of that information. Anyone else have this experience? My mortgage is through my local bank, and they have an account set aside for our property taxes, which the Bank pays our Town Office in July each year. We live in a small rural town, so our taxes are only due once per year. I’ve checked the amount withdrawn against the tax invoice from our Town office, and the amount equals each other, so there are no fees taken out of our account. Sure it’s easier for me to not lift a finger and have them do that, but I’d rather have the $60/year in my pocket for what amounts to 5 minutes of work, at most, each year to go into online banking and pay the taxes electronically, or walk to their office and hand them a cheque. We were 3 years into a 5/1 hybrid at 5.25%. Originally we also had a 2nd mortgage at 8% but we paid it off with a gift from my parents over the summer. We re-fi’d to get out of the hybrid and ditch the escrow account, and we thought we scored with the rate we got – rates had gone up since we purchased – though in hindsight not so much. We now have a 30-yr fixed at 5.75%. We were offered a lower rate for points, but we did the math and found it would take over 10 yrs to pay for itself; we’re not sure we’ll be in the house that long. We used our original mortgage broker and paid less than $3k in closing costs. The rate we have sounds really high now, but we’re out of the hybrid and our monthly payments are good, and I don’t think it would be worth another $3k to re-fi again. Cybrgeezer that is a good point. I got all excited about refinancing. We are 10 years in a 30 year mortgage at 6% interest and owe 62K on our mortgage. We have been able to get quotes for refinance, but even at 4.875 “no” closing costs (really more like $1800 in closing) it really doesn’t save us any money, unless we were willing to do a 15 year and pay more each month, which we can do perfectly well on our own without the costs of refinancing. Around NJ best rate I’m seeing is 5% on a 15 year. I would love to refi but can’t — we have two Gov’t grants (SHIP and Storm Improvement) against our house that won’t be forgiven until 2011 and 2013. If we refi, we have pay off the outstanding balance of the grants. :( Two bad the Stimulus package doesn’t waive that requirement…. Any advice on refinancing when you are underwater on you mortgage? We did an 80/15 with 5% down. We have about $20K left on the 15% and are on track to pay it off in about 5 or 6 months with accelerated payments. We hope to refinance our 80% at that time. The bad part is that we’ve lost almost $100K in value on our home and the few lenders we’ve talked to are asking about another $40K before they’ll listen (for a total of $60K). By the time we get there, our rate is going to adjust and kill us. I guess it’s THEN that they’ll listen. As long as we can pay, they don’t care about helping you. @#70 – We have been trying to work with Amerisave and the fees are outrageous. They wouldn’t break them down for us either. We didn’t even get to the point of applying because I was never comfortable with the vagueness and the high fees. This is how Amerisave does business. It must be legal since it’s working for them, but I thought everyone had to submit a “truth in lending” disclosure because places would package fees and not break out points etc. Especially since points can be tax deductible, I guess they break it out when you close. Either way it didn’t make me 100% comfortable either. And when I was working with them the broker kept saying he would lock but wouldn’t, then reassure me things would drop. After the third time I decided he wasn’t the brightest bulb and went back to my brick and mortar broker. Some banks will only work with you if you have an escrow account because they make sure things get paid to cover their exposure and liability. Not going to happen. You won’t find a second willing to take you for a reasonable rate. @78 and 79 – your hopes all hinge on who holds your mortgage. If it was sold off to investors, you don’t have a prayer. If it was sold to Fannie, Freddie or the lender held it there is a tiny glimmer of hope. They may allow so called no-appraisal refinances for loans already on the books. The thought being that the risk has already been taken on, why not refi the loan to a more affordable one, keep the homeowner making payments etc. It hasn’t happened yet, here is some info. I’m in the same boat, ha ha. You give good advice JD but sometimes you seem overly cautious in your own finances. You’ve locked yourself in to a higher fixed rate on the off chance that something goes wrong down the track. In doing so you’ve committed yourself to paying far more interest than you need to. Even if you paid it off in the same amount of time, that’s almost $10,000 more interest that you’d have to pay. Is it worth it for a maybe? One more thing that I think is important…the sooner you can prepay any amount, the more it will be worth over the course of the loan. I read once that the best way to kick out a loan is to write out your checks, but leave a big chunk to give to the bank the very next day (in essence, before you start paying down the mortgage). By doing this, that extra $500 will go straight to principal, and you won’t have to spend so much time getting your balnce down that amount. I may not be saying this right, but it could take 4-5 years to get that much on your principal…by writing the check on the first day of the mortgage, it becomes like 4-5 years of check writing! Could we get a copy of that spreadsheet that Kris created to play with different mortgage paydown strategies? Has anyone else experienced an extreme delay in closing on their refi? After reading your original post in Dec, we decided to refi our home with a certain large national bank before x-mas and were supposed to close on Jan. 30. However, the bank says they’re backlogged, as well as the title & deed service companies. Our new closing date is Feb. 27 and if everything is not complete (on THEIR end- we’ve completed everything necessary on our end), we will lose our 4.25% rate (30-yr fixed) and have to start all over again. good story. I looked into refinancing a month ago but decided against it as it would take 5 years to get my closing costs back and I would also lose the equity I already have in the house. We were 2 years into a 30 fixed @ 6%. We refinanced into a 20 at 4.87 and cut 8 years and 30 bucks a month. Gotta love interest when it works FOR you rather than against. We were 3 years into a 30 year fixed @ 6.5%. We’re locked in at 4.5% + 1.25 points ($2443) for 30 years. We’re waiting on an appraisal (due tomorrow). The $244 a month we’ll be saving will recoup the $7300 closing costs in less than 3 years. If we continue making payments at the level we had been, we’d pay the 30 year off in 20. We chose the 30 year just for the flexibility. Yes, the closing costs are high, but I wanted the 2 point drop to 4.5%. We’ll be here long enough to recoup, and we’ll never need to refinance (unless the Stimulus offers 4%), and we’ll have to evaluate that. I’m definitely going to keep an eye on rates, given that 4% rumor. We’re squeezed really tight right now with me losing my job, so I’m waiting for something eye-popping before I’ll consider it worth the trouble of scraping our pennies together. Thanks for the head’s up. I just requested a quote through Amerisave and they called me within 2 minutes! The guy was very vague on closing costs – he said he couldn’t get me a real figure until he had received all my info including SS# but it would be between $3500 and $4000. Ouch. I don’t think so. The guy definitely rubbed me the wrong way. We purchased a house in 07/08 with a rate of 6.625 no points, ouch. We did refi in 11/08 with a rate of 5.75 no points. refi fees: ~2k. We just closed on another refi 2/09 with a rate of 4.75 .25 points. even though we did a two refi’s in such a short period, we’ll break even on the costs in just one year! we are saving just under $500 a month compared to our first rate of 6.625. How did that happen? I guess I’m missing out on some of the details. Congrats on finally signing everything! What do you plan on doing with your new found monthly savings? Congrats on getting it done – I need to look into this as well. @J.D I think it’s only fair you get that new car now, you worked so hard on saving money on your monthly mortgage payments that Kris owes it to you. JD, what’s your take on using the difference in monthly payments for savings, vs refinancing and keeping your monthly payments the same so that your mortgage will be paid off sooner? I’ve been looking at ours, and dropping the interest rate about a percent would get us $150/mo cheaper payments, or we’d have an extra 7,000 in equity in the property after 4 years. Refinancing is in the air. Do you play with amortization tables in order to see when you will pay off the loan at your current rate of overpayment? You’re right. You’re right. What I mean is that the costs of taking out the loan will have paid for themselves. I’ll fix it. Brilliant suggestion to read the contract ahead of time from home….never thought of it, but will sure remember it. I am surprised that you went with the 30yr instead of the 15yr. I read the other article explaining your method. If your end plan is to own the home, part of that should include the time line. I understand the 30yr gives you flexibility. Some 30yr have a penalty if you pay it off early. Was any of that in the 120+pg documents? Congrats on the $250 savings, it will add up to that new car quick! Just wondering, NOT trying to start up the whole prepay mortgage versus investing extravaganza, but does investing still come out better on paper if you have no plans to move from your home, ever? Sure, big, unforseen circumstances can and do occur, but barring that, my husband and I don’t plan to move from the home we’re building. JD, congratulations man, glad you finally got the lower mortgage you were looking for! Hi JD, Congratulations on the refinance! I’m wondering if you have any advice about how much is reasonable to pay in terms of closing costs? It seems like this amount varies a lot among the different mortgage companies, in addition to the point/s they may charge for the refinance? JD — You may have mentioned this elsewhere but how come you refinanced for a 30 year mortgage? Did you consider shrinking the mortgage term or was the monthly payment for a shorter term just too expensive? When my husband and I refinanced we dropped our 30 year mortgage down to 15 years, we paid off a chunk of principal at the time but our monthly payments are now just a little more than we paid on the original mortgage. And just to be paranoid, how do you know that the papers you signed where the same as the ones you read over the weekend? My husband and I have vowed to only purchase homes we can afford on a 15 year loan. Though we have half the size home as our friends, over the same amount of time we have twice the equity. Our home is for sale and now we can afford to step up to a larger home, keep our payments the same, and at a 15 yr mortgage with a large down payment and we own our home 15 years from now. I never read my mortgage papers before I sign them. There is a 3 day right of rescission for all 1st mortgages. So I read the papers the night I sign. That way I am reading the exact papers that I have signed and have 3 days to back out if the mortgage doesn’t match what I was told. I believe in the other posts he mentioned that although he took a 30 yr mortgage, they’re planning on keeping the payments the same as what it was before. But, if something were to happen, they can stop prepaying and use that to instead build his chicken coop or whatnot. Once the crisis has passed, they’ll continue to accelerate their mortgage payments. Congrats on the fiscal improvement, JD! I was really hoping to take advantage of the stimulus package. It would have dropped our mortgage from 40 yrs at 8.63 to 30 yrs at 5.25, and decreased our monthly payment by a full third. But, since we were unemployed in July and have been working like dogs since to make ends meet, we haven’t missed a payment. And since there is no work in his field, we’ve been working freelance. Not having a W-2, they tell me, disqualifies us. I am NOT a happy camper at all. We really needed the help. Oh well. Nothing has changed, really. We’ll still pay as long as we can and hope for work. Kris and I pay $2000 toward our mortgage every month. We would do this whether we had a 15 year loan or a 30 year loan. So, in essence, the loan term is irrelevant. The only thing that matters is the interest rate. Congratulations J.D.! That was a great move. I noticed today at Penfed’s site that the rate for a 15-year loan is more than a 30-year! (5.25% for 15 v. 5% for 30.) Now this is probably an anomaly, but I found it interesting. Congrats on the new mortgage; it sounds like you did a thorough job venting the paperwork. Enjoy the extra $249 a month. Great post. My cousin has a car loan and has been asking about the economics and approach to refinancing that. Do you have any research or thoughts on that angle? Are you going to use the extra money you are saving to pay down the mortgage quicker? I am currently going through the refinance process myself. For comparison purposes I was wondering what your break even time was or in other words, what were the closing costs associated with the 4.96 rate you receive?. I might have missed this, but may I ask what your total closing costs were? We patiently are looking to do the same. We’re currently at 5.75%, don’t know what we may find that is lower. ..and I’m a baggie washer too! Mike B, I don’t have the docs in front of me, but my recollection is that it will take exactly 10 months to pay off the closing costs. That is, the closing costs were in the neighborhood of $2500. Maybe I missed this – but where did you refinance, was there any points, and how much were closing costs? If I can get. 4.96 on a 30 year, I need to jump on that. The most minor of quibbles… but something to remember when you refinance is that part of lowering your monthly payment comes from a decreased principal that is once again stretched over 30 years. And depending on how long you’ve had your previous mortgage, that can make a big difference. But my point is that it’s not really a savings “per month” of $250 because you’re not on your original 30 year timeline. You’re on a revised timeline. Now, as you said, what matters it that you’ll still be paying $2000/mo and more will go towards principal now, which is where you catch up on the closing costs, and then start to shorten your timeline to where it is now, and then finally shorten the timeline to be better than your old mortgage. It is *impossible* to save $250/month washing baggies, unless you spend over $250/month on baggies in the first place. Also, it can’t really take longer to save any amount of money per month. It takes exactly one month to save $X/month. I noticed that too, but I wasn’t going to say anything. Dropping from 6.25% to 4.96% will save JD ~$226 per month in interest. Actual saving due to adding the closing costs onto the end are a LITTLE lower. And though this will go down every month as his principal is reduced this is an okay estimate for the first year. This calculation is easier since either way he will be making the same payment. Things get a little fuzzy when the payment adjusts because the new amortization throws off the principal and interest portions to meet the new payoff date. Congratulations! My wife and I are actually closing on a refinance mortgage tomorrow to do the same thing. Our payments are going down $175 per month, and we’ll continue paying the same amount we have been to pay off the 30-year mortgage in approximately 21 years. It’s a smart approach JD, choosing the 30 year to be safe, but then paying the mortgage down with extra principal payments. My husband and I ran the numbers and considered the ‘what if’ scenario quite a bit before ultimately deciding on the 15. I think this makes perfect sense, especially considering your current line of work. Congratulations! My wife and I are in the process of doing a refinance ourselves, though we’re going for a shorter term product (allowing us a better rate than longer-term loans would) as we plan to pay off the house in about 4 years. I did a fun little spreadsheet – and you know I’m a math nerd if I can call a spreadsheet fun – as I was looking at different products and possible interest rates, and we’ll recover our closing costs via interest savings in about a year. Even with our greatly accelerated payment plan, we’ll still save a couple thousand $ in interest by the time all is said and done. Congratulations JD! My wife and I just closed on our own refi on Friday. We went from 6.5% to 5.125% and are now saving over $700 a month. We’ll recoup the closing costs in about 7 months and, lucky for us, the home (apartment) is already worth 2x what we paid for it 3 years ago (but who knows if that will be true next month). JD – my husband wants to refinance our place. We’d drop almost 2% but we also want to sell next year. Is it worth it to refinance? What does that do to our FICO score? Anything? Just looking for thoughts as to how to proceed. Congratulations on your job well done! It might be worth it to refinance. The only way you’ll know for sure is to run the numbers. You’ll need to account for closing costs, etc. In our case, we’d break even on the refinance if we stayed in this house one more year. Your situation might be different. Wow, 4.96%! That’s a good deal if the costs worked out. Also, it’s good to hear someone reading the entire mortgage document. I can’t believe people don’t when this is going to be the largest single expenditure in most people’s lives. CONGRATS! We’re currently finishing up some home renovations so that our house will appraise well (we’ve got a bathroom gutted right now which would surely hurt). After we’ve finished, we are definitely going to try our hardest to refinance to a lower rate. I think we might be able to knock almost 2% off of our current rate, which will save us about $300-$400 a month! Hahaha “You’d have to wash a lot of baggies to save $250 a month.” TRUE! Thank you for advocating reading all signed documents and putting your money where your mouth is and really doing it! A shining example of what everyone ought to do. Congrats on a successful refinance! My only question is: Why did it take them 2 months?!?! Your form shows an interest rate of 5.047%, not 4.96%. Explain the difference please? (i.e., Did you roll the refi costs into the loan, or, was the difference in the rate the, ahem, commission the mortgage issuer charged on top of fees, or what?) The difference between these interest rates equals a $17,487 difference in cost on a $201,000 loan unless my math is bad. This is how all mortgages work, isn’t it? I think all four mortgages we’ve ever taken out have been the same way. We might borrow at a 6% rate, but the truth in lending statement will say 6.08% (or something like that). My understanding is that this reflects monthly compounding. That is, the interest rate on the loan may be 6%, but when compounding is considered, it’s 6.08% (or whatever) annualized. This is the same thing as annual percentage yield at your bank. ING Direct may give you 1.65% APY on your deposits, but your actual interest rate is probably something like 1.62%. The difference is a result of compounding. Same idea here. So, the interest rate and the APR are different. Does that make sense? We are supposed to close on our refi this afternoon. I hope it goes as well as yours. We are dropping our rate from 6.25% to 5% flat, with fees under $2K. It has been remarkably easy on our end. Should save us $200 a month, we will make our money back in under a year. Thanks for prompting us to refi JD. Although Amerisave was never the way to go for us, they wanted $6k in fees. We have saved $300/month by moving from our 1630 sq ft rental in Seattle to our 2324 sq ft rental in Portland. I have not owned a house since 2002, and I may never own one again — though I admit to fantasizing about owning this one, with its half-acre of fruit trees, blueberries, rhodondendrons, roses, vegetable garden, herb garden, and grape arbor! But then I think that’s just a left-over impulse, and really I no more want to own a house than I want to own any other kind of “stuff”. We’d been idly talking about refinancing last year (because we’d made some silly decisions and were about 18 months from our ARM shifting out of its fixed-rate stage) but with the housing market going down the drain, we were kinda terrified about even attempting it. Thanks to your post in December, I actually got the ball rolling, and closed on our new loan last week. *Such* a relief to go from an interest-only ARM (I know, I know) to a 30-year fixed rate… and the best part is that with the lower rate, our fully-amortized payments are going to be the same as our interest-only used to be! @DanL: 2 months seems like a long time, and maybe JD’s actual processing took less time, but for comparison’s sake, it took us nearly 2.5 months to get everything taken care of. I’d asked a different bank’s mortgage department how long their processing was taking these days, so I’d know whether I had reason to be grumpy, and learned that they were often taking 60-90 days to do all the underwriting. Sounds like there’s been a tremendous amount of people looking to refi and of course, the banks are doing a *lot* more vetting of applications than they used to. I ran JD’s numbers, and it came out that he will actually spend $36,500 MORE in interest over the life of this loan than if he had stayed with the old loan. However, because he pays extra principal each month by making even $2000 payments, it is more complicated than that and he make actually come out ahead. JD, did you do all this math? Most folks don’t have the discipline to keep paying the extra and of course, your mileage may vary. I’m surprised. For the sake of the website, I’d of thought for sure you’d refinance for 15 years. Starting your 30 years over is no way to get rich slowly. If you were affording your previous mortgage you prob could’ve kept the payments near the same going to a 15. Not only that, but you’ve encouraged hundreds of readers to do similar, instead of saving thousands dropping to a 15 year mortgage. Think of the articles you could’ve written on the money you saved. I think you should write one on what you would’ve saved had you done that. And if the Blog bubble pops, you can always go back to the box factory. Did you even read any of the supporting documentation about my decision? I provided links to past info on this topic, and even mentioned some of my reasoning in comments in this thread. This comment is particularly relevant. I’m well aware that a 15-year mortgage offers lower costs. Kris and I don’t plan to have our mortgage that long, though. We talked about this at length, and both agreed that a 30-year loan gave us greater peace of mind. We don’t plan to hold it that long, but who knows? But I agree: I should do a post in which I run the numbers to compare. Maybe for tomorrow afternoon? I did read your comments. 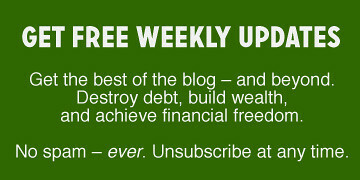 Honestly, I have received a lot of my good finance practices from this website and your recommendations. This one just seems contrary to that. That being said, I have the highest respect for you and your sight. It’s been tremendously helpful for me and many others. I hope you don’t take this critique personally. I was just confused, Ian. I thought I had made it clear why we chose the 30 year mortgage. There are many people who choose a 30 year when they could choose a 15 year. (Some people choose a 30 year when they could pay the loan off!) There’s no one right answer on this. In our case, the peace of mind was paramount, so that’s the direction we went. Well, I think there’s a psychological factor in taking more time than you need to pay something off. Leaving aside mortgages for a moment, I just bought a used car. I could’ve financed it for any number of months at similar rates, but I chose 36 (and considered less). Sure there is a “safety cushion” of more time. But I prefer the “safety cushion” of less money spent. I imagine nearly everyone says to themselves that they can pay it off early if they want when they are financing something. And I will bet that almost all of them don’t. Now there are people who are highly disciplined and do just that, no question. I’m sure you are one of them. But, all payments being equal I’d have gone with a 15-year and paid extra on that! Lastly, my mortgage seems the biggest obstacle to retirement than anything. Pay off that house and I can remove my nose from the grindstone. I’m not able to do it quite yet, but it’s a financial goal to pay it off early myself. @Paul (53): The Truth-in-Lending Act requires the lender to include certain closing costs when calculating the APR. The idea is that when shopping around for a mortgage, getting some quotes that have a lower interest rate but require points v. a higher rate with no points, you can use the APRs to compare apples to apples. The costs will be included in the APR even if you do not roll them into the loan. We too, opted for the 30-year for the exact same reason you and Kris did–for the breathing room that we would need should we experience a gap in income. We bought a home we could afford on 1 salary and we have been paying an extra $100 toward the principal every month. The link to Givens, Mortgage Prepayment Made Easy, was helpful and I’m wondering if we couldn’t do that instead of the flat $100. Love the site. Have been reading for months, first time posting a comment. Thanks. We recently considered doing this. The penalty is about 6 months of interest. However, I worked out what we would save on the entire mortgage if we instead put that amount down as a balloon payment. After 5 years, we will have saved the amount that the refinancing would have saved and, after 15 years, we’ll have saved more than triple that amount while reducing the length of the mortgage. I suppose breathing room might be worthwhile, though, so I haven’t walked away completely. I understand perfectly the psycological and financial benefits of paying of your mortgage early. I’d love to do it. The “why not?” for me is mostly about life-phases – a topic I’d love to see discussed more here. I’ts natural to be earning more and more throghout your 20’s, 30’s and so on – until retirement, when your income decreases. But it is also natural to have bigger needs in the 20’s and thirties. We are starting a family now, and while we would truly love to pay off our mortgage, save and invest (and we do) – we would also love to have a house that’s suitable for kids, a car, furniture and all this. We are establishing all these things these years. And you can’t do it all – can you? So one of the main reasons people don’t pay off their mortgages (and in some cases get into debt, and don’t save for retirement in the early years and so on) is that they are in a life phase with high spending needs (compared to the rest of your life) and low income (compared to later in your working years). We are doing a Total Money Makeover (Ramsey style) – we are. But sometimes I wonder if it’s worth it to put all this financial effort into it these years with kids coming and so on. Because now is a time when we are starting a family. So I can understand why not. What information did you get from Google? Did you have general questions about the definition of some terms or words or was it more for amortization tables or something similar? We did exactly the same – refi on almost an identical amount. But, we landed a 4.75% interest rate. Talk about excited. We were able to dump the two notes we had on this house. One of them would have come due in a few years with a balloon of 10% of something more hideous. We knew we’d pay that off no matter what but the refi did so much more for us. Thankfully our rental property has just sold. We close in a week. We’ll take some of the funds and pre-pay a years’ worth of payments while making the normal monthly note. This is to protect against anything catastrophic. The bulk of the proceeds of the sale will go towards the principal of the new refi note. The goal is that we’ll have this note paid off in 10 years. The last credit card will be paid off next month and we’ll only owe on the house. I’ve worked my whole life to get here. I’m 54 and extremely proud of where we have positioned ourselves. Such blessings we have. Truly a thank you Jesus moment for us. We still live as if it were pay check to pay check and invest the balance. Why didn’t you pay 1 point to get your rate a little lower? I thought paying 1 point up front was a good way to save you money in the long run. Did you just not have the extra $ to pay the point, or is there a particular reason why you chose not to? My wife & I are starting our refi process. My Saturday morning has been reading back over all your refinancing articles. Huge help as we refine what we want. Thanks JD!